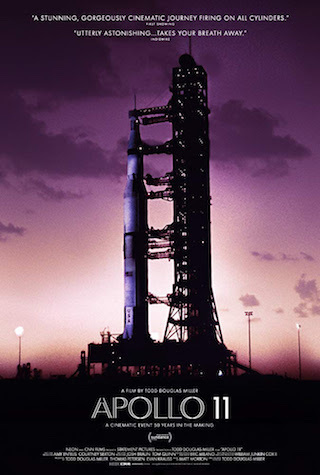 "The most perfect movie that will ever be made about its subject, Apollo 11 takes the purest documentary idea imaginable—telling the story of the first journey to the moon and back using only the footage captured in the moment—and rides it all the way home. Conceptually, it’s a masterstroke: Other films have leaned into narration or interviews, while Damien Chazelle’s brooding First Man took a somewhat incidental leap into personal grief. But by mining a trove of NASA’s archival footage (much of it unseen since 1969 or ever), disciplined filmmaker Todd Douglas Miller places an unmistakable emphasis on the thousands of people who toiled in quiet synchronicity, pulling off America’s greatest mission without a hitch. Apollo 11 will bring you to tears—it’s a reminder of national functionality, of making the big dream happen without ego or divisiveness." Joshua Rothkopf for Time Out.